I am only a month late, but this is one of my New Years resolutions.......to blog!!!!. This morning I downloaded the blogger app (thanks Rachel Brown for mentioning it on Facebook), so there is no excuse. 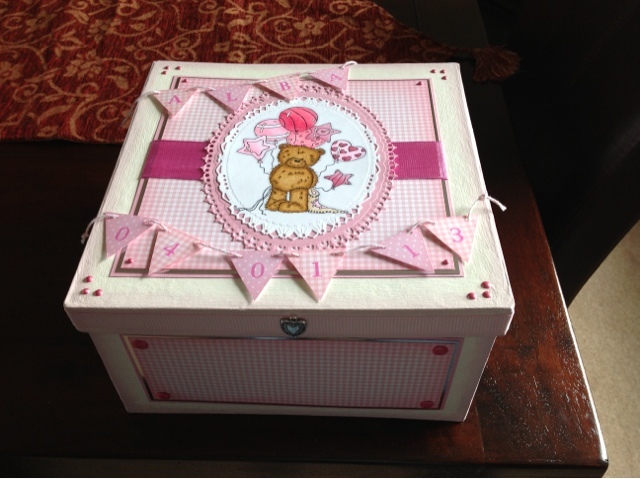 I thought I would share a box I was asked to make for a new baby. The Popcorn image I have coloured using Copics and Spectrum Noirs and then cut it out with a spellbinder grand decorative oval, and layered this. I have cut the bunting freehand and added her name and date of birth. In the corners I have added cosmic shimmer pearl glue. You cannot see it from my poor picture, but on one side of the box (using the clarity letterbox) it says "keepsake box" and on the opposite side it says "special memories". I have then added card candy to each corner of the side. I hope you like it and I will be back soon.